1- Army Rally Pokhara on 17 to 25 May 2015 for Bagmati, Dhaulagiri & Gandaki Anchals. 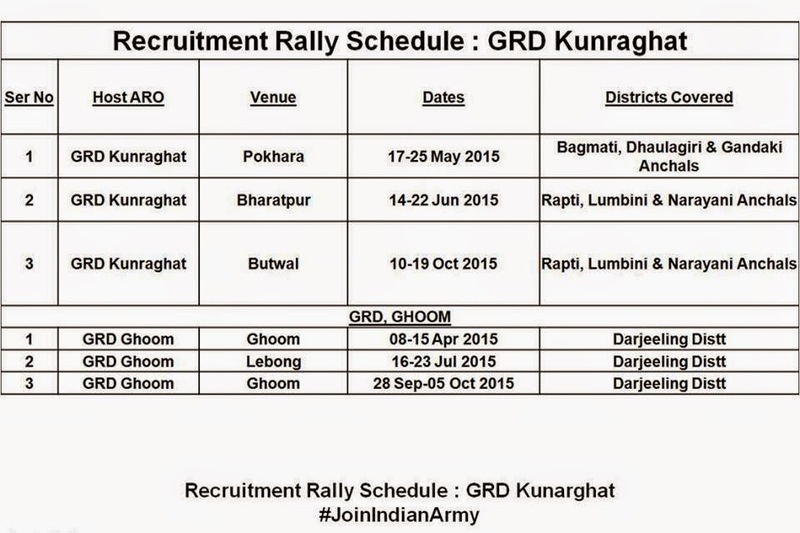 2- Recruitment Rally Bharatpur on 14 to 22 Jun 2015. for Rapti, Lumbini & narayani Anchals. 3- Rally in Butwal on 10 to 19 Oct 2015 For Rapti, Lumbini & narayani Anchals. 4- Ghoom on 08 to 15 April 2015, Lebong on 16 to 23 jul2015, Ghoom on 28 Sept. to 05 Oct.2015 for Darjeeling Distt.